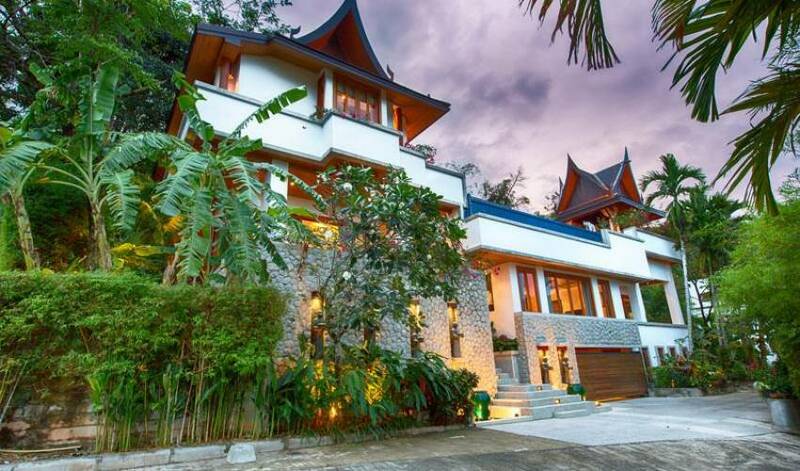 Villa 4422 is an exquisite sea-view Phuket villa set in a tranquil hillside estate just minutes away from the sands of Surin Beach. 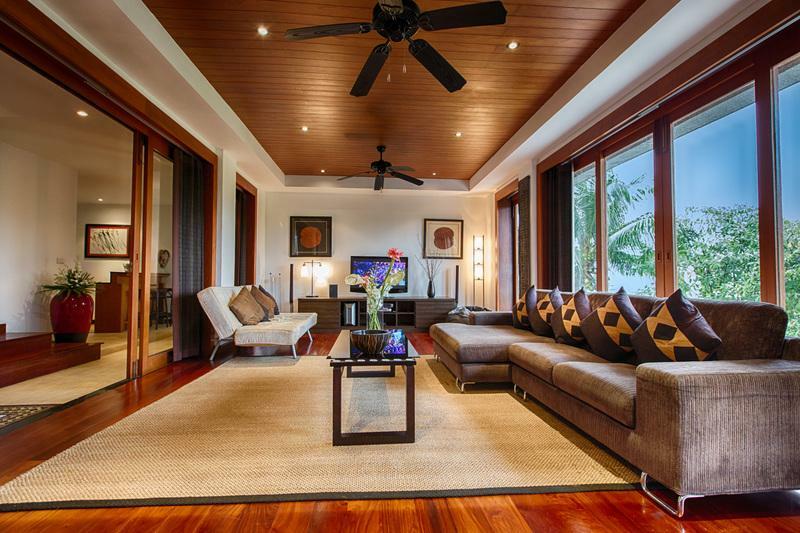 Brimming with elegance and a fascinating collection of art and artifacts from around the world, this four-bedroom, fully-staffed villa embraces easy, yet luxurious tropical living. Ample deck space and an infinity pool provide plenty of outdoor comforts, while its stylish living and entertaining areas add flourish and fun. Three ensuite bedrooms feature extravagant bathtubs for added romance, while the fourth bedroom is an ideal retreat for children. 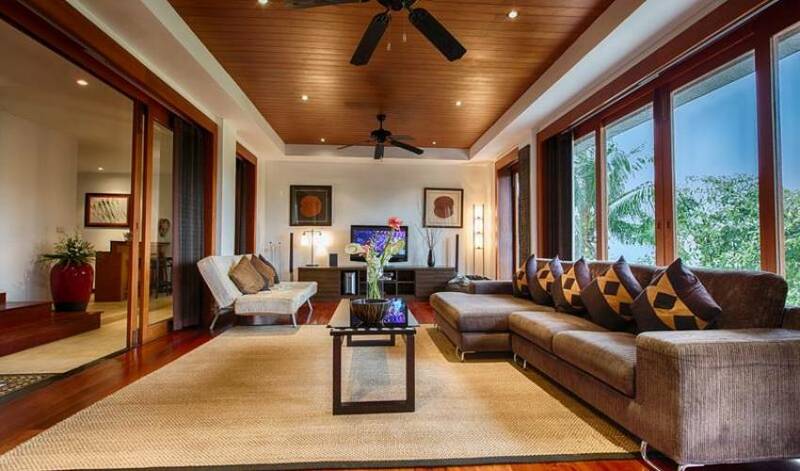 A fantastic Phuket escape for families or small groups. 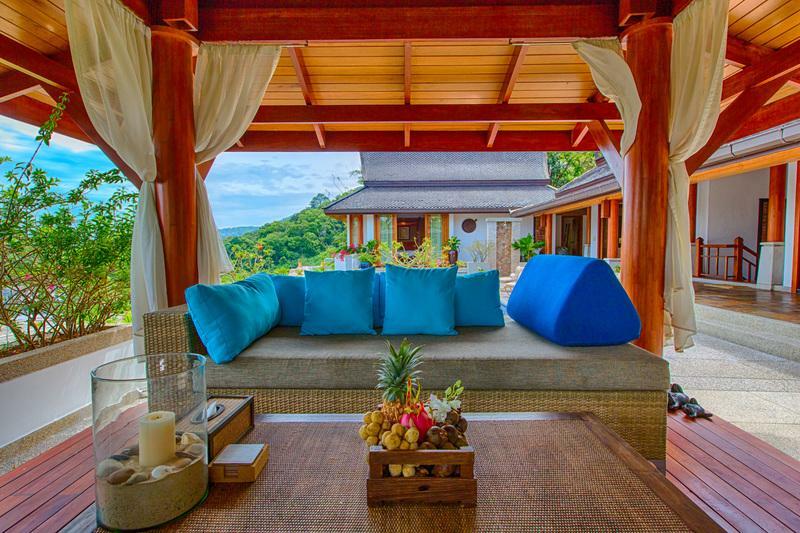 Blending a tropical setting, enchanting contemporary Thai design and dazzling sunset views, Villa 4422 is an unforgettable Phuket villa escape. 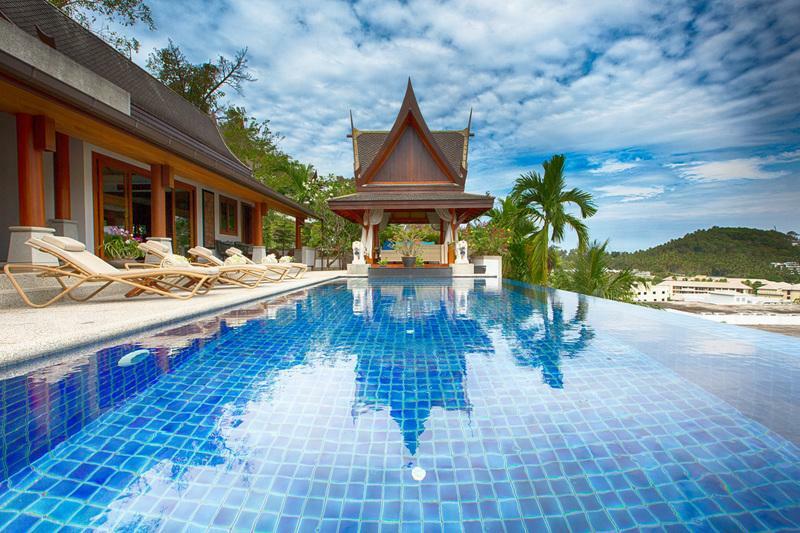 Set within the Baan Thai Surin Hill private estate on the hillside, the villa’s pitched-roof pavilions, 10m pool and spacious terracing allow guests to enjoy island life to the full. The top floor of the main pavilion houses an inviting living room providing a top-notch and comfortable entertainment area, plus a modern kitchen and dining room. 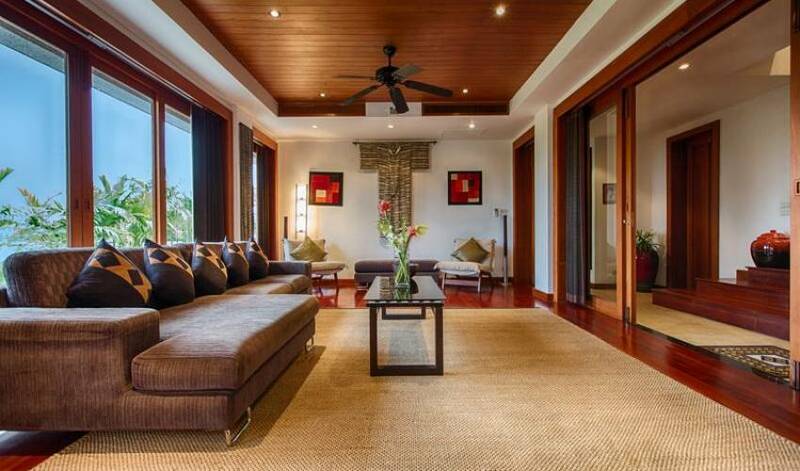 The large master suite, steeped in glamour, sits in a separate poolside pavilion. Just a few steps along a stone path behind the master is a queen-bedded bedroom with a garden view and adjacent bathroom, perfect for children. The remaining two bedrooms are each king-bedded with large bathtubs in their ensuite bathrooms, found on the bottom level together with a lavish entertainment room and pantry. The villa reflects its owners’ passion for travel and art, evident upon arrival as guests receive a serene greeting from a superb collection of Buddhist statues at the stone-wall entrance. Throughout the villa are intricate wall hangings, embroidered fabrics, African masks and other works of art sourced from cultures around the world. Floor mosaics and eye-catching design details combined with an extensive use of wood, marble, stone and other natural materials give the villa a distinctive flair. 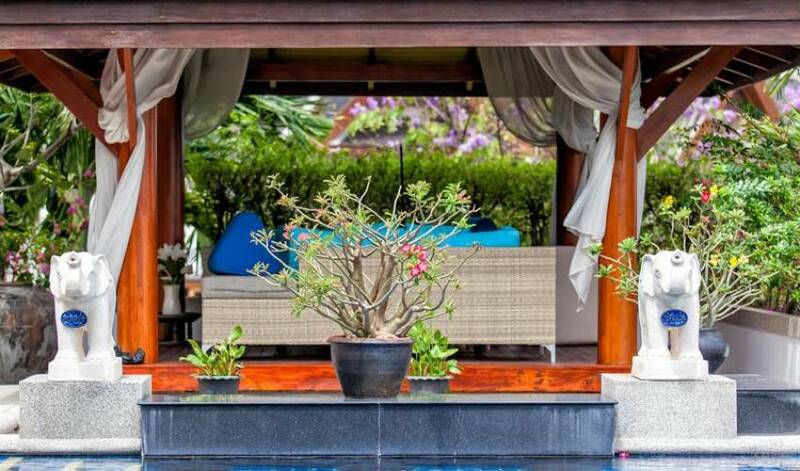 Guests are given a warm welcome by the villa manager, who will assist with all aspects of their holiday as well as arrange for the delicious Thai meals and breakfasts prepared daily by the chef. Nearby Surin Beach is home to a good range of beachfront dining spots, boutique shops and a growing number of beach clubs. 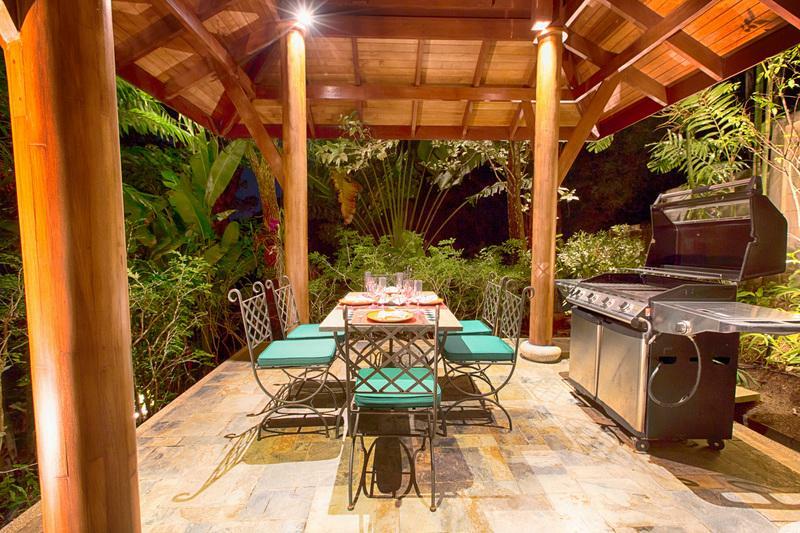 Golf courses, marinas and many outdoor leisure activities are all within easy reach of the villa. The richly designed master bedroom is set in the front corner of the villa’s top floor in its own pavilion. Its four-poster king-sized bed and built-in sofa provide luxurious comforts, while the ensuite bathroom abounds with romance and flash, highlighted by a white terrazzo marble Jacuzzi bathtub and outdoor garden area. Just behind the master suite is a queen-bedded bedroom with a tranquil garden view. A connected bathroom has a shower. Two guest bedrooms sit at opposite ends of the bottom level, each providing an ideal retreat for couples with king-sized beds, comfortable seating areas and private balconies, plus elaborate ensuite bathrooms. One bathroom features a striking black terrazzo sunken bathtub while the other has a shiny red double bathtub set in the outdoor garden. adjacent kitchen is designed with deep green granite work tops, wooden cabinetry and smart stainless steel appliances. Downstairs is a large entertainment room with a high quality home theatre perfect for an evening of movie-watching. Serving as a fantastic gathering spot, the room is strewn with beanbag chairs and comfortable sofas, two of which convert into beds if extra sleeping space is needed. Just across the corridor is a pantry with a fridge, microwave and plenty of counter space to prepare snacks and drinks. 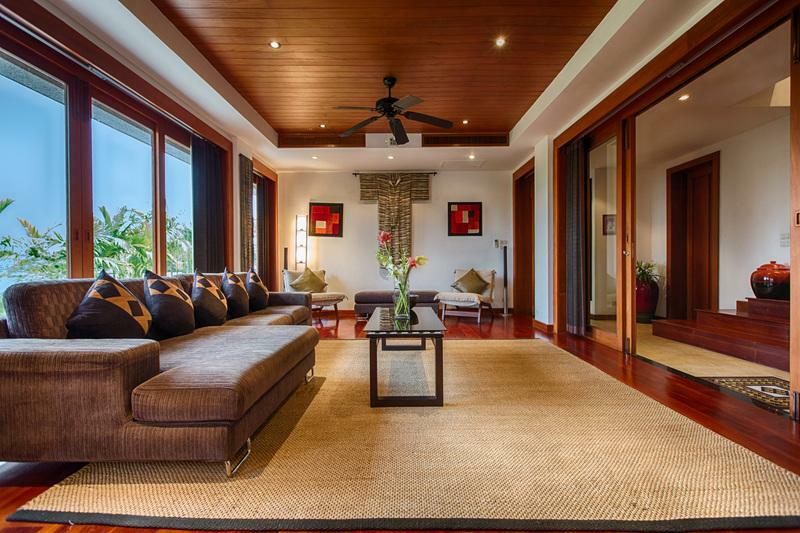 Brimming with bright bougainvilleas, tropical trees and exotic flowers, Villa 4422’s outdoor living areas are every bit as sumptuous as its indoor spaces. The 10m infinity pool that reaches into the blue sky forms the villa’s carefree tropical heart. Guests will need to ensure there are cocktails at the ready to enjoy in the cool of the pool with its submerged bar stools. 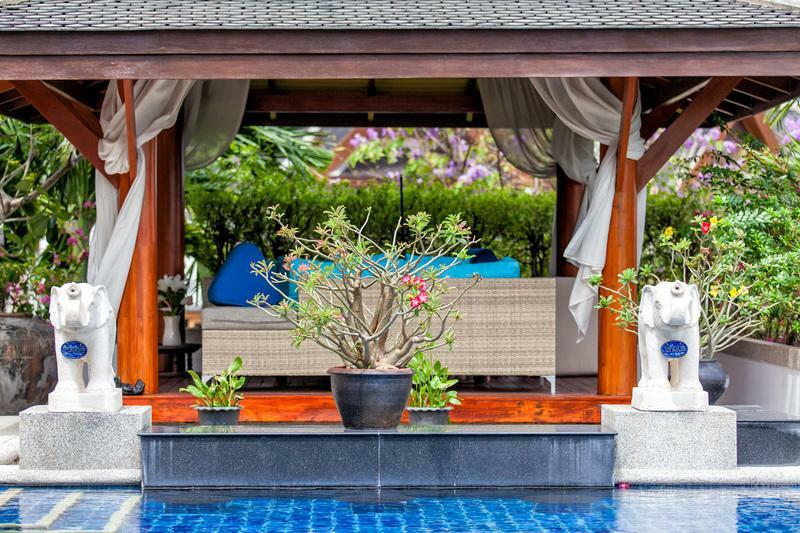 Next to the pool is a gorgeous peak-roof sala (gazebo) with ceiling fans and a poly-rattan sofa set with vivid blue cushions and pillows providing a comfortable spot for afternoon tea or evening sundowners, whilst enjoying the jasmine-scented breezes. 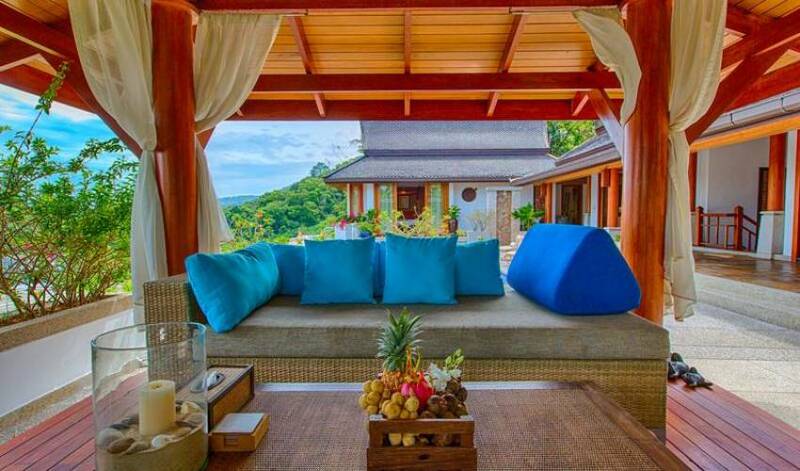 Across the entire front of the villa’s main pavilion is the sea-view terrace. The villa’s roof provides all-day shade for part of the terrace, while its sandwash sundeck has four sunbeds for catching some rays poolside. A stone path at the back corner of the pool terrace leads to a shady garden area and another fan-cooled sala with a dining table and barbecue, a perfect place to relax for an informal meal. Living areas Indoor living room with TV, iPod dock and indoor/outdoor sound system; Entertainment room with surround sound system and 2 sofa beds; indoor dining for 10; shaded poolside terrace and sundeck, pool sala with sofas and a garden BBQ sala with an outdoor dining table. Pool 10m sea-view infinity pool with submerged bar stools. 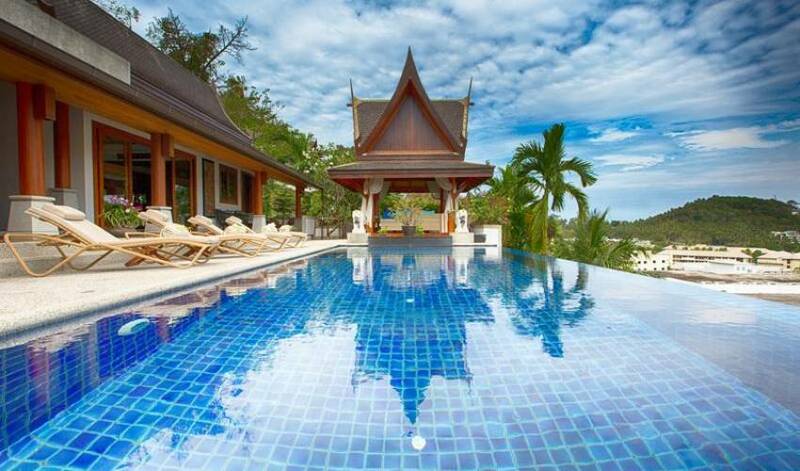 Staff Villa Manager, Maid; Chef, babysitter and masseuse on request (extra); car & driver on request (extra). Communication Wifi broadband internet; local telephone; IDD, printer and fax on request (extra). Entertainment Entertainment room and living room with indoor/outdoor sound system; international cable TV, DVD player and iPod dock. For children High chair and baby cot included; other equipment on request (extra). Additional facilities Gym and tennis courts at the estate clubhouse. Events Suitable for parties of up to 15 people. Property area 960sqm (villa), 1,200sqm (land). Guests of Villa 4422 enjoy the personal service and care of a full-time villa manager, chef and housekeeping staff on site from 8am to 10pm daily. With our staff’s blend of Thai hospitality and an international standard of service, a relaxed and pampered holiday is assured. Villa manager Our full-time, English-speaking villa manager will be pleased to arrange your travel and touring requirements, restaurant and golf bookings, and ensure that your dining and personal needs are cared for at a five-star level. Chef Our full-time chef is on hand to prepare delicious Thai meals and selected Western dishes. Housekeeping Two full-time housekeepers are on hand to clean the villa daily and assist with meal service. Spa/Massage Local spa and beauty specialists may be brought in to provide massage, manicure and other treatments (prices on request). Enjoy a selection of Thai cuisine prepared by the skilled chef, who may also cook a limited range of Western dishes by arrangement. The chef would be happy to discuss any special dietary requirements and children’s meals. Guests are encouraged to meet with the villa manager and chef soon after their arrival to plan meals in advance and find the best options to suit everyone’s tastes. 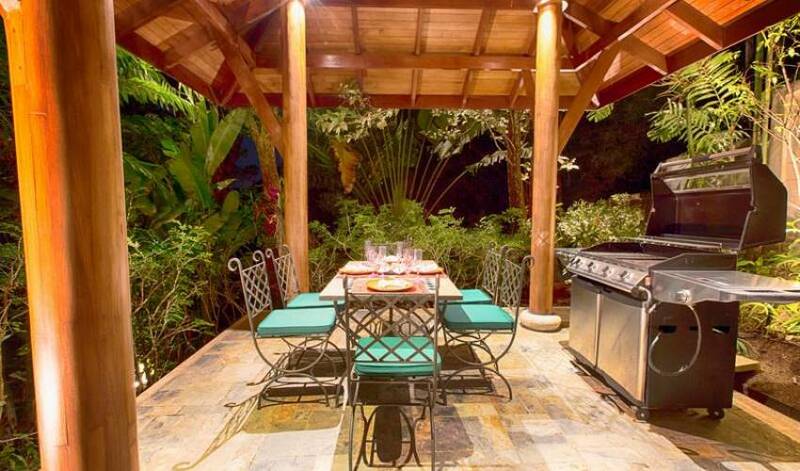 The chef will need ideally a day’s lead time to source provisions and prepare the meals. Guests who prefer to self-cater have the modern Western kitchen at their disposal, and are welcome to ask for assistance with the grocery shopping. We recommend that guests provide the chef with a ‘float’ to cover the grocery shopping. Villa 4422 is a welcoming villa for families, however toddlers will need to be closely watched around the pool and terrace area. Kids, of course will love the pool, especially with its easy access to the kitchen and living room for swim breaks. If it happens to be a rainy day don’t despair, there are TVs with cartoon channels and DVD players to keep the wee ones entertained indoors. needed items on your behalf. And when the excitement of exploring the villa starts to wear off, check out our Things to dopage; there’s plenty in the area to keep kids of all ages amused throughout the holiday. Suitable for hosting events of up to 15 people, Villa 4422 provides a perfect backdrop for an intimate gathering, small dinner party or family celebration. Contact us to learn more about the terms and conditions associated with events and how we can assist you in organisation. Feel like a body scrub or massage? Just ask our staff to bring the spa to you! We can recommend deluxe treatments carried out in the privacy of the villa by fully trained spa therapists. Airport transfer service for up to eight guests may be arranged for an extra charge. For additional transport requirements, please ask the villa manager to help arrange for taxi service or car hire, with or without a driver. 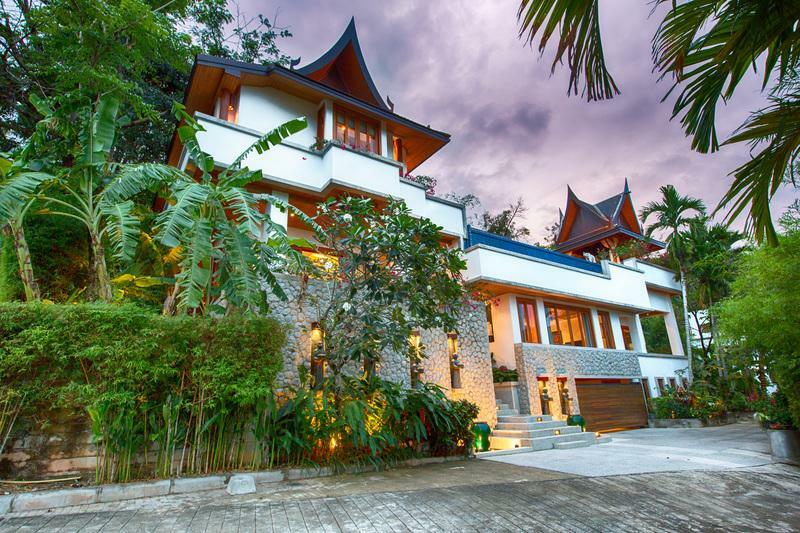 Villa 4422 enjoys a prime position within the 18-villa Baan Thai Surin Hill estate. 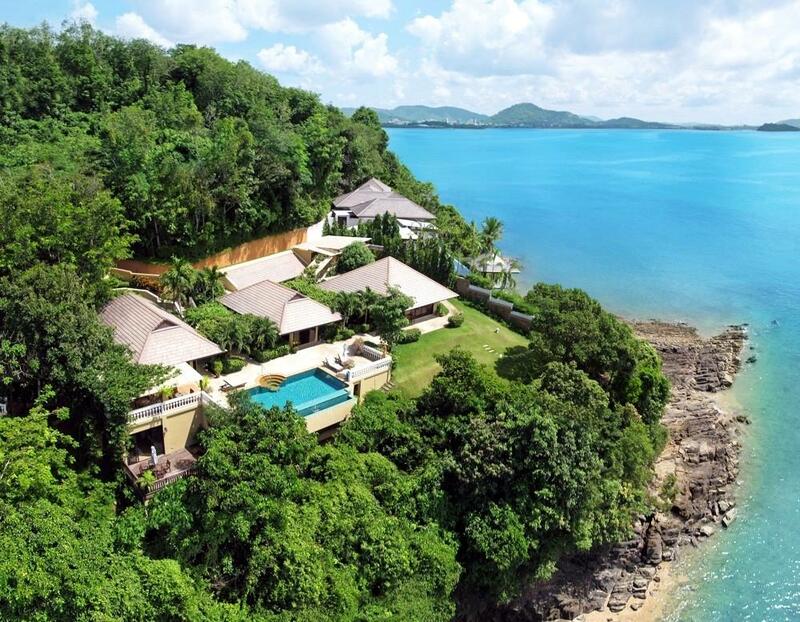 The villa's hillside perch allows panoramic views over Surin and Bangtao bays, divided by the lush headland that’s home to the prestigious Amanpuri resort. Nearby Surin Beach is Phuket’s premier spot for beachfront dining and sunset cocktails, while its surrounding roads offer more superb dining choices, spas, and boutique shops. A 10-minute drive will bring you to Bangtao Beach, a long stretch of soft sand where the Laguna Phuket resort complex and its surrounds offer a wealth of water sports, golf, upscale dining and other leisure activities. Within the estate, enjoy a round of tennis or a training session at the gym at the clubhouse,free of charge. Explore the delights of the Andaman Sea aboard a luxury yacht charter, or on a scuba diving or snorkelling excursion. The beautiful sights of Phang Nga Bay, Raya islands, Similan Islands, Koh Phi Phi and more are all within an easy day’s sail. Explore Phuket’s beach club and resort dining scene: decadent brunches, DJ dance parties, beachfront barbecues, romantic sunset dinners. Make a splash and keep fit with an array of water sports including windsurfing, sea kayaking and standup paddling. Enjoy a round of golf at the Laguna Phuket Golf Club, Blue Canyon, Mission Hills or other Phuket golf courses. Indulge in a relaxing spa session at the Banyan Tree, Twinpalms or Amanpuri resorts, or unwind on the beach with a simple Thai massage. Discover Phuket’s rich history and traditional life on a cultural tour of Phuket Town. Learn more about the history behind the restored Sino-Portuguese shops and mansions and sample some of the island’s best local cuisine. Learn the secrets of making fragrant, spicy and flavourful Thai cuisine in a cookery class. Delve in to the nightlife of Patong Beach: dance the night away in a disco, stroll the bizarre and bawdy Soi Bangla walking street, savour cocktails and wine at a chic waterfront bar. Explore Phuket’s interior for some outdoor adventures: elephant and horseback riding, ATV, waterfalls and jungle trails, the Gibbon Rehabilitation Centre, zipline sessions, bungy jumping, agricultural tours and more. Browse for art, clothing, gifts and antiques at The Plaza Surin, Paul Ropp, boutique shops at Twinpalms and Amanpuri resorts and other shops along the streets of Surin.